Finley gave Hunter the nickname "Catfish" in 1965 because he thought his 19-year-old pitcher needed a flashy nickname. A story circulated that Hunter's family gave him the nickname as a child when he went missing and was later found with a string of catfish; there is no truth to that explanation. Hunter never played in the minor leagues and his first major league victory came on July 27, 1965 in Fenway Park against the Boston Red Sox. In 1966 and 1967, Hunter was named to the American League All-Star team. 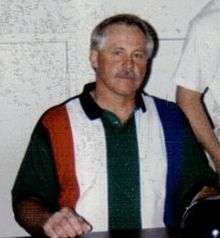 Hunter continued to win games, and in 1974 received both The Sporting News's "Pitcher of the Year" award and the American League Cy Young Award after going 25–12 with a league leading 2.49 earned run average. The A's also won their third consecutive World Series. After a contract violation on an annuity by Finley in 1974, Hunter won arbitration in December and he was allowed to leave the Athletics as a free agent. Hunter's statistics while he was with the Athletics were impressive: four consecutive years with at least 20 wins, and four World Series wins without a loss. He had won 161 games for the A's, 131 in seven seasons in Oakland and 30 in his first three seasons in Kansas City. Hunter recalled being scared after he was declared a free agent. "We don't belong to anybody", he told his wife. While with the Yankees, Hunter was a resident of Norwood, New Jersey, preferring to live outside of New York City. He returned to his farm in Hertford where he grew soybeans, corn, peanuts, and cotton, and was a spokesman for diabetes awareness. Hunter noticed arm weakness while hunting in the winter of 1997–1998. He was diagnosed with amyotrophic lateral sclerosis (ALS), or Lou Gehrig's disease. Along with Billy Williams, Hunter was inducted into the National Baseball Hall of Fame in Cooperstown in 1987. At the time, Hall of Fame officials would always defer to the player's wishes in determining which team would be memorialized on his Hall of Fame Plaque. Before and after his induction, Hunter spoke highly of his experiences with both the Athletics and Yankees and his appreciation for both team owners, Charlie Finley and George Steinbrenner. For this reason, he refused to choose a team and thus the plaque depicts him with no insignia on the cap. He was credited by Steinbrenner as the cornerstone of the Yankees in their return to championship form. 1 2 3 4 5 6 7 8 9 10 11 Berkow, Ira (September 10, 1999). "Catfish Hunter, Who Pitched in 6 World Series for A's and Yankees, Dies at 53". New York Times. Retrieved August 15, 2013. 1 2 3 4 5 6 Coffey, Michael (2004). 27 Men Out: Baseball's Perfect Games. New York: Atria Books. pp. 118–138. ISBN 0-7434-4606-2. 1 2 3 "Jim "Catfish" Hunter". State Library of North Carolina. Retrieved 2008-02-28. 1 2 3 "'Catfish' spins first perfect regular AL game in 46 years". Eugene Register-Guard. Associated Press. May 9, 1968. p. 1D. ↑ "'Catfish' Hunter said winner over Finley in arbitration fight to become free agent". Montreal Gazette. UPI. December 16, 1974. p. 15. ↑ "It's open season on Catfish". Toledo Blade. Associated Press. December 18, 1974. p. 39. ↑ Lincicome, Bernie (September 10, 1999). "Catfish forever altered economics of sports". Pittsburgh Post-Gazette. (Chicago Tribune). p. C-5. ↑ "Catfish selects Yankees, Pirates offer short $ $". Pittsburgh Post-Gazette. Associated Press. January 1, 1975. p. 43. ↑ "Catfish accepts Yankee offer". Montreal Gazette. Associated Press. January 2, 1975. p. 9. ↑ "Catfish narrows field". Leader-Post. Regina, Saskatchewan. Associated Press. December 28, 1974. p. 19. ↑ "Finley making moves to keep Jim Hunter". Montreal Gazette. Associated Press. January 2, 1975. p. 12. ↑ "Judge upholds Hunter ruling". Milwaukee Journal. wire services. January 4, 1975. p. 13. ↑ "Hunter ruling stands but Finley to appeal". Montreal Gazette. UPI. March 27, 1975. p. 41. ↑ "Finley loses Hunter appeal". Miami News. August 19, 1976. p. 4C. ↑ "Catfish was treated like animal". Bangor Daily News. Associated Press. January 9, 1975. p. 13. ↑ "200th win for Catfish". The Hour. Norwalk, Connecticut. UPI. September 20, 1976. p. 22. ↑ "A medical miracle has saved the Yanks". Edmonton Journal. Associated Press. September 28, 1978. p. E1. 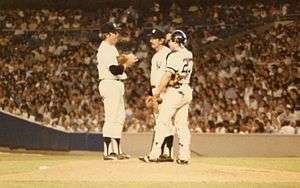 ↑ "Diabetes strikes 'Catfish' Hunter". Edmonton Journal. Associated Press. March 2, 1978. p. C5. ↑ Anderson, Dave (September 17, 1979). "Catfish Hunter: a man's man". Miami News. (New York Times). p. 2C. 1 2 "Catfish Hunter dead at age 53". Daily Times. Portsmouth, New Hampshire. Associated Press. September 10, 1999. p. B1. ↑ Anderson, Dave via The New York Times. "Catfish Hunter still planning on retirement", Star-News, September 15, 1979. Accessed May 24, 2016. "He has lived in Norwood, a leafy Bergen County town less than half an hour's drive from Yankee Stadium; he has succeeded in remaining a farm boy." ↑ Norris, Tim (December 12, 1988). "Control pitcher". Milwaukee Journal. p. 1D. ↑ "Catfish Hunter helping diabetics". Evening News. Newburgh, New York. Associated Press. July 22, 1990. p. 2A. ↑ Pabst, Georgia (July 14, 1993). "Catfish Hunter is still pitching". Milwaukee Journal. p. D2. ↑ Bock, Hal (September 10, 1999). "Ace pitcher and baseball's first free-agent star". Pittsburgh Post-Gazette. Associated Press. p. B-5. ↑ "Hunter Is Buried in the Town Where He Learned Baseball". New York Times. September 13, 1999. Retrieved August 16, 2013. ↑ Catfish Hunter Award (2004–present). Baseball-Almanac. Retrieved 2011-08-19. ↑ "Perquimans County Chamber of Commerce/Visitor Center & Jim "Catfish" Hunter Museum". North Carolina Department of Commerce. Retrieved August 24, 2013. 1 2 3 "Catfish Hunter dead". CNNSI.com. Retrieved August 24, 2013.